27 years of the Young Life Home Tour. 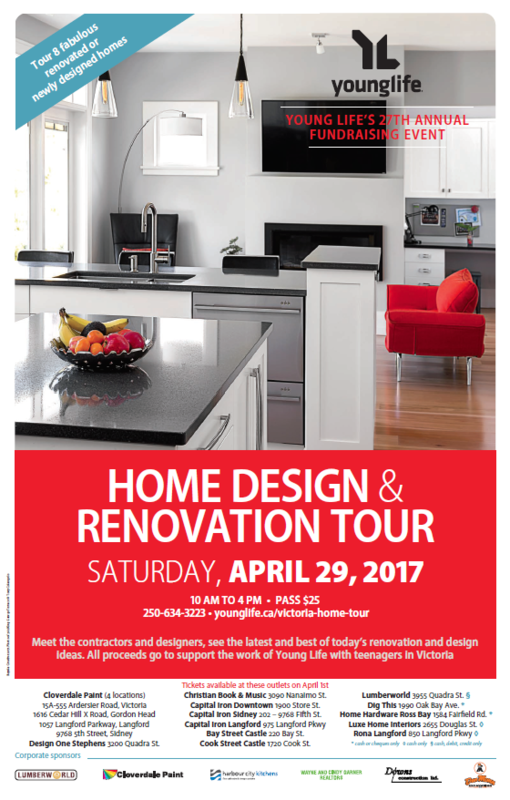 Now in it’s 27th year, the Young Life Home Design and Renovation Tour continues to be a community favorite. Come and experience the creativity and artistry in each of these 8 unique homes. This year will showcase homes like a 1930 renovated, charter home in the heart of Cook St village, a relocated, waterfront heritage home on Dallas Rd, a church converted to a hip living space in Fernwood, a 4000 sq. ft. complete reno and landscaping home in Uplands and a modern oceanfront new build on Ten Mile Point. We have gorgeous new homes featuring state of the art “green “ technology to share, three oceanfront homes and many with spectacular views that are located in the main parts of Victoria. You can get fantastic ideas for your own renovation or grab a friend and you can just enjoy the tour and all it’s artistic creativity for fun. Your ticket will serve as your guidebook and provide all the information about the projects that you are seeing. Have the opportunity to speak face to face with the professionals who built, designed, or facilitated the projects, and be motivated to get started on that project you’ve been putting off. This self-guided tour allows you to navigate yourself through the homes at your own pace. As the tour is only on one day this year, you can take in all the homes or pick and choose your favorites. They are in a close proximity this year’s so it will be doable in one day. This fantastic event is a highlight of the year and cannot be missed! Come be part of a day that funds the work of a non-profit organization that fosters meaningful and life-changing relationships with youth in Victoria. All money raised from this tour goes directly to Young Life’s work with the teenagers in the Greater Victoria Community. Christian Book & Music 3090 Nanaimo St.
Capital Iron Downtown 1900 Store St.
Capital Iron Sidney 202 – 9768 Fifth St.
Bay Street Castle 220 Bay St.
Cook Street Castle 1720 Cook St.
* Lumberworld 3955 Quadra St.
* Dig This 1990 Oak Bay Ave.
* Home Hardware Ross Bay 1584 Fairfield Rd.